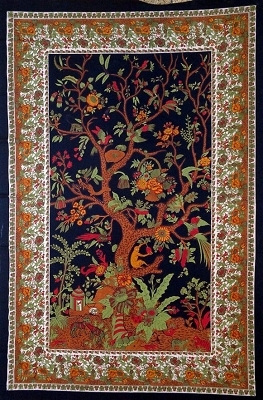 Beautful and versatile, this Tree of Life tapestry is perfectly at home as a beadspread, wall hanging, tablecloth or rioom divider. Handloomed from 100% cotton in India, this is truly an all-purpose home accent. You are only limityed by your imagination! Caren for this lovely tapestry is simple, machine wash separately in clod water then either tuble or nad dry.